adve nturous spirit led him to work as a cabin boy on voyages to China, Japan, North Africa, Russia, and Spain (among other places). Eventually he met Robert Peary, the man with whom he would 'discover' the North Pole. After several failed attempts and brushes with death, Peary and Henson were the first men to reach the North Pole. 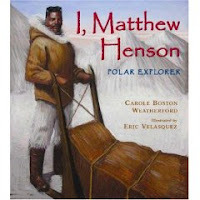 Henson's warm relationship with the Inuit people (he learned their language and taught other men on his treks about their culture) and his skill with dog sledging were integral to their success... and yet for many years after they reached the North Pole, Henson's contributions were downplayed because he was African-American. This book goes into enough detail to be useful for school reports and it has cool photos and an exciting story that will appeal for recreational reading, too. 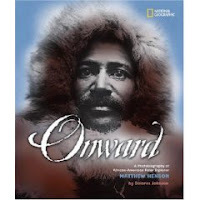 Matthew Henson's story is interesting and gives much to think about and discuss. Remember him when kids come begging for biographies! A search for "Matthew Henson" in my library's catalog led me to North by Donna Jo Napoli. North is the story of Alvin, a boy with dreams of being an explorer. He pictures himself going to Africa, Asia, the Amazon... Unfortunately, his mother is so overprotective that she won't even let him buy a bicycle with his own money. When Mamma finds out that a drug dealer approached Alvin on his way home from school, she insists on having an elderly neighbor walk him to school every morning. For Alvin, it's the last straw. He's been studying the polar explorer Matthew Henson in school and he decides to follow the footsteps of his hero. He'll travel to the North Pole and see with his own eyes what Henson described as "fierce beauty". So he sets off. He's got a backpack full of clothes, a sleeping bag, and $439.00. First stop, New York City. From there all he's got to do is keep traveling north, right? My one complaint is, of course, the lack of an author's note... I would have loved to see what inspired Napoli to write this book, where she turned for research, and if she traveled to the Arctic... but then, I am a big author's note geek. We know this. I suppose the point of this post is to show how books can lead you in different directions and how one book can connect you to all kinds of other books you might never have found otherwise. I never would have picked up North if I hadn't had an interest in Matthew Henson, which was inspired by I, Matthew Henson. I've read several books lately that have inspired me to seek out more information and led me to other books. I hope to explore more connections in children's literature in the coming months, so keep your eyes peeled for that! I work with a company that leads trips to the North Pole. The season starts about ten days from now in April. During the trips they provide a daily blog at the website http://polarexplorers.com. Thought you might enjoy following along. Next year (2009) we're doing a special centennial trip in honor of Peary and Henson's journey. I did a stint as a librarian myself - it is wonderful how one book can lead to another, and sometimes to an entire new world or interest.